Rules alone cannot teach you how to do something. Written instructions are insufficient. Culturing food reminds me of this regularly. You can’t learn it all from reading - whatever “it all” is. Set aside the book and “read” the ingredients; pay attention to them as if they matter. Put down the instructions and ask a human being for advice. Be prepared to be foolish, ignorant, naive, and wrong. 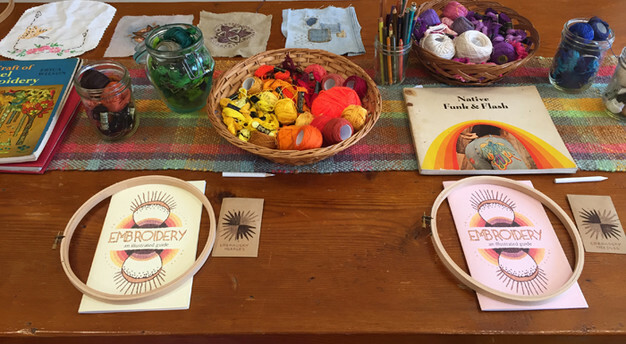 I recently taught a workshop on Embroidery at Fiber on Main in Hurleyville, NY, where I shared this quote as a prompt for learning skills more intuitively as part of an artistic practice. This class was less about learning each stitch (though that was a significant part of it) and more about teaching how to use embroidery in your own work, using stitches to your advantage, and how to avoid burning out on your designs, with tips for developing concepts that look good at any stage of done. The format of this class was partially inspired by The Art of Fermentation, the first cookbook I've ever purchased, which contains little to no recipes and instead approaches fermentation with an attitude that precision is not nearly as important as understanding what is going on and why. I don't particularly give a damn how much salt or yeast or sugar someone else's recipe suggests, I'd much rather know the WHY of adding these ingredients, which is much more practical when you're looking at a batch of kombucha that has turned to vinegar and leaves you wondering what you could've done differently. This approach of curiosity is integral for my learning style, and has carried through to my teaching style. Not to achieve an end result, but to have a grand old time making mistakes and disasters and accidental delights and masterpieces on the way. 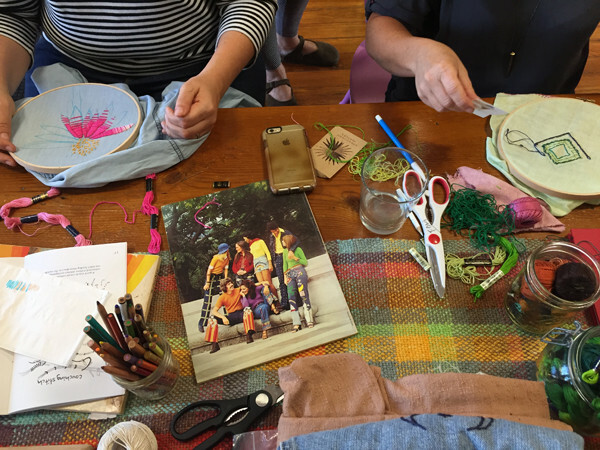 This class was such a hit that it will be returning for Fall, join us at Fiber on Main, Wednesday October 4th, from 5-8pm. 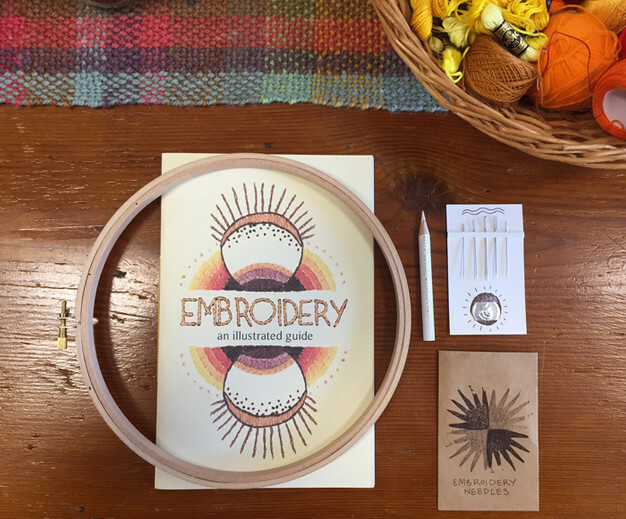 Join us and receive a copy of my hand drawn embroidery book, an embroidery hoop, needles + threader and a fabric marking pencil. 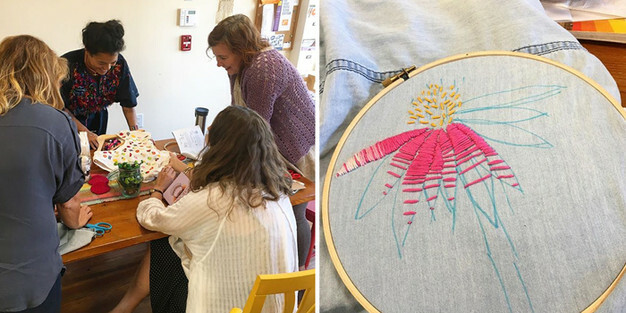 These last two images are from participant Megan Brenn-White, of me showing off some vintage embroideries, and of her own echinacea flower on the back of a chambray shirt.